The Wasatch Front Regional Council recently announced the projects awarded funding in 2019. We are pleased to report that all of the communities that requested Active Transportation Plan Funding this year have received it! The communities are: Sandy, Draper, Millcreek, Midvale, Murray, Taylorsville, Holladay, Clearfield, Sunset, Syracuse, Clinton, and West Point. 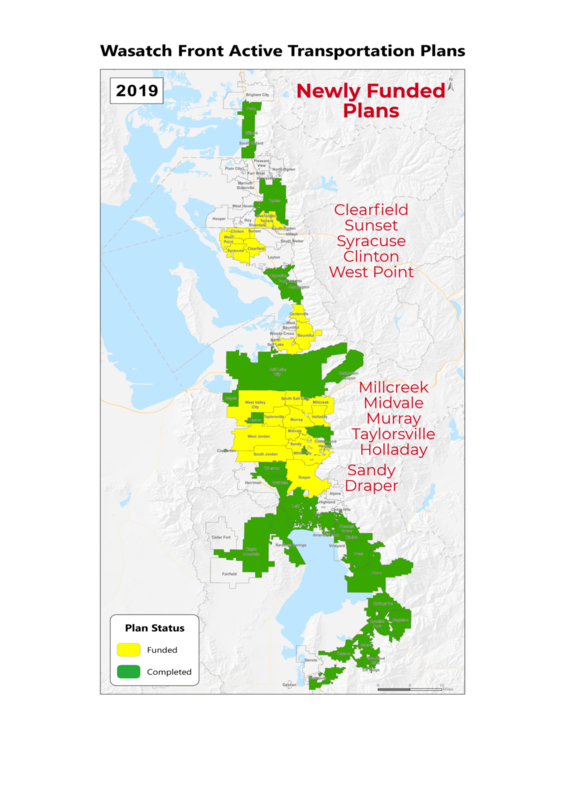 This means that of the four counties that make up the Wasatch Front (Utah, Salt Lake, Davis, and Weber), 63% of the communities have a plan adopted or funded. 84% of the population in these 4 counties live in a community that has a plan adopted or funded. Looking at the map below, the GREEN communities have adopted plans, and should be in the process of implementing them. The YELLOW communities have the funding to create an Active Transportation Plan, and are in the plan development process. Is your community neither green nor yellow? Contact us! We’ll help you get your community rolling toward a plan! We still have a lot of work to do to turn every community yellow and watch them progress to green! Click here to learn more about the Wasatch Bike Plan.